I have been arguing for a little while now that the zero carbon home is not a sensible policy goal. The twin aims of low-energy housing and renewable power generation are both worthy in themselves but it make little sense for developers to be forced into providing both on each and every site, which by current reckoning will be the case after 2016. Many low energy houses will be built at locations unsuitable for renewable power plant and, conversely, there is absolutely no reason why renewables shouldn’t be employed in all manner of places which have very little to do with low-energy buildings. By asking for both elements to be incorporated into new housing schemes, the government is once again making a target which will end up distorting common sense and ultimately wasting energy and resources. Nevertheless, I have been surprised just how quickly the deceit that is the zero carbon home has started to unravel. A report in last week’s Building magazine states that two independent reports, both commissioned by housebuilders, have concluded that the best way that housebuilders can meet the zero carbon target on their forthcoming developments will be to switch from selling to leasing the finished product. What possible difference can this make to energy consumption? Absolutely none at all. But, by so doing, the developers can enter into contracts with the leaseholders to force them to purchase electricity from a renewable power supplier, and that way the developers can claim the houses are zero carbon. Apparently, EU energy rules insist that homeowners must be able to choose any power supplier on the market and the only way of ensuring that the householders don’t switch to non-renewable supplies is to remove the rights that go with property ownership. Talk about the tail wagging the dog. This really is a ridiculous situation. But this is what happens when you have government by soundbite. Silly targets get set and then clever people find ways of meeting these targets, without the underlying problems being properly addressed. I went to London this morning to attend the first ever press conference of the Confederation of Multifoil Manufacturers (CMM), held at the Building Centre. The CMM consists of four members being Actis, YBS, Euroform and IPP who, combined, account for 90% of UK multifoil market. They put on a 90-minute presentation consisting of four presenters and a short Q&A session in front of an audience of around 30, made up of people working in the multifoil industry and a number of trade journalists. • Paul Newman, the secretary of the CMM, opened the proceedings and talked a little bit about the challenges facing them; in particular, the August 2006 release of a technical guidance notice from the LABC (Local Authority Building Control) advising against the use of multifoils as standalone products. Newman insisted that multifoils were being held back by old (redundant?) testing methods. He used a graph to show how multifoils had by then captured 6% of the total UK insulation market, up from just 1% in 2002, but this was now expected to fall; the graph suggested 5% in 2007. • Paul Mitton, Technical Manager of Euroform, then spoke generally about the installation advantages of multifoils, highlighting speed of installation and minimal depth. However, whilst emphasizing that site tests would be more realistic than lab tests, as has been show in the world of acoustics, he did not explain why site tests would bring about improvements over lab tests. In acoustics, elements on site invariably perform worse than they do in lab tests: here we are expected to believe that multifoils perform better on site than they do in GHB lab tests. - two roof assemblies are constructed and tested without insulation to see if they are within ±3% of each other, as regards energy used to heat to a pre arranged internal temperature. - then both assemblies are tested with 200/250mm mineral wool to see if they remain within the ±3% range. - only then is multifoil placed in one of the roofs to carry out the comparison testing. Results from the Actis tests have shown that whilst 200mm of mineral wool results in higher than predicted energy use, the Actis multifoil performs far better than the simple R-values derived from GHB testing would suggest. In fact the multifoil matches the results from the 200mm of mineral wool. This will come as no surprise to those who have followed this debate: it is the essential claim made by all multifoil manufacturers and the one disputed by virtually every other insulation manufacturer. • The last speaker was Prof Nico Hendriks, professor of Building Materials at Eindhoven University of Technology and the Principal of the BDA Test Institution, a third part approval agency. 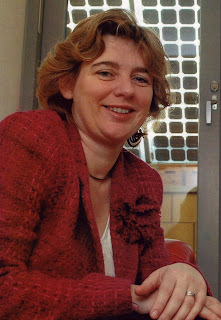 Hendriks has been hired by the CMM to take on the independent testing of multifoils. Basically, he is charged with replicating the famous in-situ tests carried out by Actis and to use the (hopefully) positive results to persuade EOTA (European Organisation of Technical Approval) to grant multifoils an ETA (European Technical Approval), which would enable multifoils to be awarded an equivalent R value and thus to be used in all European territories. He ran through the methodology that would be employed in carrying out the tests, but he was later questioned in depth on this by Roger Bisby of Professional Builder who noted that they were only planning to test against mineral wool and that in a configuration that would no longer pass UK building regs (basically wool stuffed between rafters). “Why not test against Pu foam instead,” asked Roger. Hendriks appeared to be unaware of the current requirements of Part L, saying that no one built like that in Holland anyway as they mostly used panelised roof sections. He also pointed out that there were both cost and time implications for further comparitive tests. “Why not three roofs, why just two?” went the questioning. “I am sure Kingspan would be willing to help with costs.” This observation met with a good deal of laughter from the audience, rather less from the panel. I asked what the timescale was for their application to EOTA for an ETA. EOTA is like an umbrella organisation for national bodies, such as our own BBA, which have a remit to test innovative building products. It moves slowly and is still considering whether to even look at this testing programme, let alone pronounce on it. One of the drawbacks of in situ testing is that it takes three months to carry out a winter test and three months to do a summer one as well, and the CMM have already missed this winter as a test time, so the very earliest they could have results before EOTA would be mid-2008. EOTA has to reach a consensus on the matter so it is far from clear what the outcome will be, assuming that Henrdriks’ BDA test outcome is positive for multifoils. Interestingly, there is a second independent testing station being used by the CMM for their in situ tests to place before EOTA. This was mentioned in passing by Prof Hendriks, without reference to who this might be. Later I discovered that this other test station was none other than our own BM Trada, who of course were the original independent verifiers of the Actis in situ tests back in 1997. Why Hendriks was flown in from Holland when they could have called on BM Trada from up the road remains a mystery. Indeed BM Trada didn’t appear to be present at the event at all. Maybe they are seen as being too close to Actis for comfort. In the question and answer session that followed, the lady from the Architects Journal asked what the middle layers of radiant foil actually did. Paul Mitton gave a reply that was both convoluted and unintelligible. I report that I am none the wiser! The last question was about the BRE tests that took place at a site near Aberdeen. These were essentially in situ tests of multifoils against conventional insulation and the results appear to confirm the GHB lab tests – i.e. multifoils do not match the claimed for 200mm of mineral wool insulation. Mathew King’s view was that the test was not as rigorous as the ones that they had carried out, nor as the ones that they want BM Trada and BDA in Eindhoven to undertake. Over lunch I was able to question Andrew Whittle from IPP and Claire who had flown over from Actis in France. I asked Claire if it was true that Lafarge were in the process of buying Actis: this was news to her, so it appears to be just gossip. I also asked her how Actis sold throughout Europe. She said it was a difficult time for them, as authorities seemed to be closing ranks against multifoils for similar reasons as we are seeing in the UK. Interestingly, they have never been able to sell into Germany (why does that not surprise me?) because the Germans have always insisted on hard R-value figures, which means positive GHB test results. But most other countries have been receptive to multifoils. In summary, the multifoil industry feels very aggrieved that it has been unable to establish that its products do actually work as they claim. They say that their UK market has been badly affected by the LABC advice to stop using multifoils on their own, but that many metropolitan local authorities are still happy to accept multifoils, especially in loft conversions where it is often virtually impossible to build in the correct depth of insulation using conventional materials. They seem to be pinning their hopes on a) independent testing verifying their own test results and b) consequent EOTA approval, which would give multifoils access to all European markets via an equivalent R value method which even the Germans would have to accept. My own feeling is that they are being extremely optimistic about their chances. What I didn’t hear today was any convincing explanation as to why multifoils perform so poorly in the guarded hotbox test and yet appear to equal large depths of mineral wool in comparison tests. As happens so often with the multifoil debate, I came away with more questions than answers. It’s all very well carrying out in situ tests, but it’s not altogether clear what exactly is being measured. It may be that 200mm of mineral wool as an insulator is very much worse than the lab tests indicate, in which case the multifoil comparison tests are simply illuminating this point. And why always test against mineral wool? It is rarely used in roof applications these days because it’s hard to meet the requirements of Part L without an absurdly deep rafter. Why not test against more realistic options for today’s housebuilders? And why can’t they come up with a scientifically plausible explanation of the workings of multifoils? Whilst I don’t doubt the sincerity of the multifoil manufacturers, their arguments are still some way short of compelling and on the basis of what they showed us today I really think they have their work cut out if they are to win the approval of EOTA, certainly first time around. It is far more likely that EOTA will ask the same question as Roger Bisby. “Why just test against a roof stuffed with mineral wool? If you want our approval for this unorthodox test procedure, let’s see more tests against a wide range of insulation products.” It could be 2010 before EOTA reaches a conclusion by which time the multifoil industry may well be history. 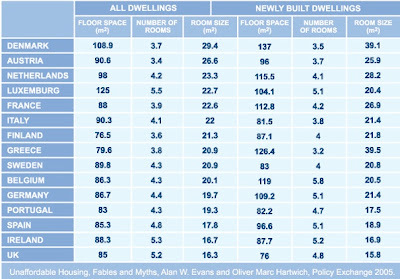 If you want a good example of just how complex low-energy housebuilding can be, take a peek at window ratings. Glazing is unique in this environment in that heat can flow both ways through it. Whilst at night, heat radiates out through the glazing, during the day and particularly when it’s sunny, substantial amounts of heat passes into the house. Over the course of a year, a south-facing window is often a net energy contributor. Because of this, the traditional way of measuring energy efficiency, the U-value, becomes just a little shabby when dealing with glazed areas, because it only deals with heat loss. 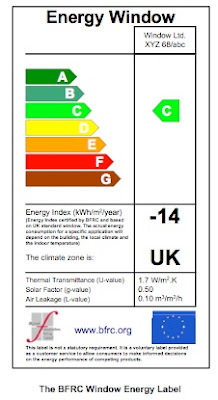 Now a few years back, some bright spark had the idea of introducing an energy-rating scheme for windows, just like the ones you see on fridges and washing machines, ranging from A (excellent) to G (not so excellent). They have been running schemes like this in North America, Australia and New Zealand but Europe has been slower to adopt. However, at long last it has got underway and there is now a body known as the British Fenestration Registration Council (BFRC) that has got the ball rolling in the UK. The window rating system looks at three aspects of performance. Now the g value bit is interesting because the amount of heat admitted into the house obviously depends on the orientation of the window. A south facing window will absorb far more energy than a north facing one. How can you reduce this to a single value? I think they fudge this and assume it’s east or west facing, because they have to come up with a constant in order to make a comparison. Interestingly, the very low U values windows (which are sometimes triple glazed) tend to score rather poorly on the g values and it is felt there may come a point where an ultra low U value fails to make any appreciable difference in heat loss terms. Hell, I warned you it was complex. Anyway, by hook or by crook, the BFRC have come up with a system that supposedly takes all of this into account (you can read more about it on their website if you are so inclined) and reduces all this conflicting data into just seven categories. The very best windows, the A rated ones, are reckoned to be net heat contributors over the course of a heating season without having to be mounted in the south face of the house. When the BFRC originally set up the scheme, they didn’t anticipate there being many A rated windows, at least not for many years but the scheme has only been running 18 months and already there are loads of As, so much so that it’s beginning to resemble the A level results from Jade Goody’s comprehensive. The question is now arising as to whether the standards have been set too low. Sliding sash windows are dealt with in a separate category and thus far only one firm, Masterframe, have bothered to submit their products for testing and their best rating is a C. It is not thought that it will ever be possible for a sliding sash to get an A rating, because of the design constraints. Now whilst this haul represents a fair number of windows that have been submitted to this entirely voluntary scheme, it does make you wonder whether there is much point having an F or a G rating. This is hardly going to be a selling point for a window, especially as the building regulations, revised in 2006, call for minimum rating of D on new work or E on replacement windows. If an F rating is a fail, what is the purpose of having a G rating? Looks like the scheme itself will have to be re-rated. Anyone for an A* or even an A***? It’s not exactly a finished work, as you can see, but it seems to me that these policies are addressing most of the relevant climate change issues as far as housing is concerned, with one big exception (see later). It’s very easy to snipe at politicians but I think Ruth Kelly deserves some credit for doing this. I suspect she has greater powers of concentration than Mr Prescott. What worries me here is that the whole edifice of the government’s climate change policy is built on a number of assumptions that may turn out to be horribly wrong. To be fair, this is in the nature of all climate change debate, but nevertheless it has to be borne in mind that we are involved in spending a great deal of money insuring ourselves against a highly unpredictable risk, namely what is going to happen to our climate. As our knowledge on this evolves, the perception of the risk is bound to alter, so it may well be that in ten years time the measures we are now talking about look to be either massive overkill or totally inadequate. The built environment is, as everyone knows, a huge contributor of atmospheric CO2. I think overall it accounts for almost half of our carbon emissions, of which housing contributes the great bulk (between 25% and 30% overall). Whereas we struggle to reduce carbon emissions from transport and industry, it is relatively easy to improve the energy-efficiency performance of housing, new housing in particular. The problem with the government’s strategy, as outlined by Ruth Kelly in last week’s Building magazine, is that it is concentrated on improving standards for new homes. It’s all very well producing millions of supposedly zero carbon homes over the coming years, but if we still have 25 million high carbon homes around in 2050, the overall carbon emissions from housing will have increased substantially. And turning high carbon homes into zero carbon homes is a very expensive and disruptive process. To be fair, the issue of what to do with the existing housing stock is on the To Do list. It’s just that so far the government has baulked about doing anything about it because it would be an unpopular measure – to force people to carry out energy efficiency measures on their existing homes. Thus far, it’s only the easy decisions that have been made: the unpleasant ones are ahead. In the meantime, the government is still committed to building more homes at a faster rate than we have done for many years. If they were really serious about halting the rise in carbon emissions from the housing sector, they would call a moratorium on all new housebuilding and spend the next 40 years either upgrading or replacing the existing stock. That is the uncomfortable logic that faces us. Bugger housing shortages, bugger rising house prices, bugger social inequity, bugger zero-carbon developments, just stop building. I just don’t see the world being ready for that yet and I don’t think Ruth Kelly can do anything about it. In the meantime, as the Building strapline helpfully points out, she plans to meet the environmental challenge by awarding stars to sustainable homes. I’ve just got back from Swindon where I visited the soon-to-open National Selfbuild & Renovation Centre. It’s quite a departure for the world of selfbuild, a permanent exhibition centre that will be open seven days a week throughout the year. It’s the brainchild of the Buildstore group and in particular their CEO Raymond Connor, who has been building up to this for several years. His hope is that it will provide a one-stop shop for any and every one planning new homes, renovations or improvements. It’s a big complex, about the size of a B&Q Megastore, and it includes a Potton show house and a fascinating deliberately dilapidated Victorian cottage where you can look at the problems and solutions facing renovators. My own favourite bits were the cut-aways of floors, walls, roofs and drainage systems: I have never seen the inside of a septic tank — a notable first. By any stretch of the imagination, it’s a huge gamble. Buildstore are planning for 100,000 fee-paying visitors a year; if they get that, it will be judged to be a major success for them and for their many exhibitors. It’s not an unrealistic proposition because there are at least this number of people who visit the various selfbuild exhibitions at the moment, but a permanent exhibition of this scale is an untried concept. Connor’s hope is that it will grow the market and help put selfbuild on the map: others are sceptical that people will be persuaded to pay £10 each at weekends to visit what is in effect a giant showroom. But what can’t be doubted is that it is going to happen and you have to admire the vision and determination that have got it off the ground. From what I saw yesterday, I would recommend a visit if you are at all interested in understanding the building process, even if you have no plans to build anything anytime soon. It struck me that it’s a great educational facility and I can quite see parties of school kids being taken around here in years to come. But that, of course, is not why it’s there: its purpose is wholly commercial. I hope it works out for them: the country has seen nothing like it before and we will all be that little bit richer for having such a centre. The opening of this centre marks a step change for the selfbuild movement in this country. I picked up the following gem at a New Year’s Eve party. Some builders I know are carrying out renovation work on a Cambridgeshire church. They put a Portaloo on site and had access to a cold tap, but planned to use the church itself for meals and site office. An overly-concerned parishioner took a dim view of this and sent a complaint to the Heath and Safety Executive, who responded by threatening to close the site down. It breached Health & Safety legislation. What could be wrong? Were men working off inadequate scaffolding? Were roofers scaling the tower without harnesses? No, nothing exciting like that. The problem was that the site didn’t meet the modern health and safety standards. There should have been a changing room where the workers had access to hot and cold water. And there had to be a proper flushing loo, not a chemical toilet. The wonderful irony is that the job description involved installing a flushing, drain connected toilet into the church for the very first time in its history. Apparently this wasn’t good enough for Health & Safety; according to the current rulebook, they should have first installed a temporary flushing loo before they began work on the permanent one. Here’s hoping the New Year produces a few more bizarre construction stories!